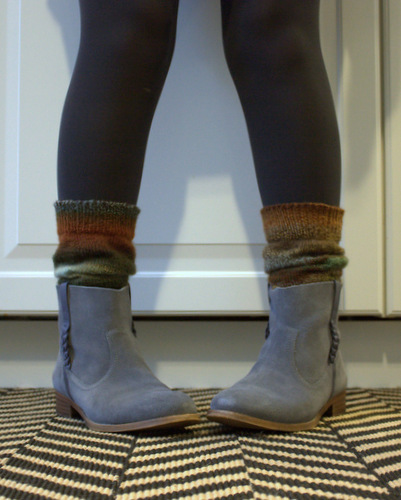 Poor weather is the perfect excuse to finally get around to finishing some old projects, like these knee socks. Which I started… oh, over a year ago you say? The yarn is Schoppel-Wolle Crazy Zauberball in 1660, which is a nice autumnal mix of brown, green, and blue. While I love the colors, I don’t think I’ll be coming back to this anytime soon — too splitty and difficult for my taste. No wonder it took me so long to knit that second sock. 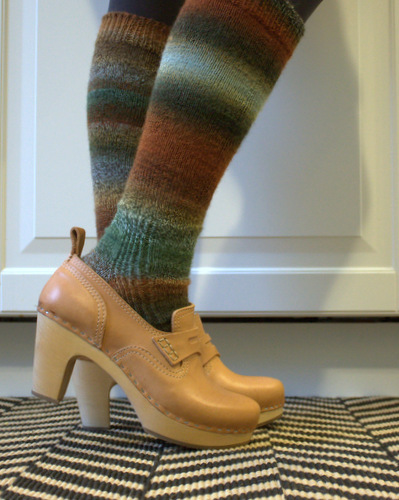 Is there anything better than custom-fit knee socks? I want to knit so many more, except that it would take me a lifetime of procrastination to finish them all. Let’s face it, I’d rather bake brownies and do a little shoe/sock fashion show in the kitchen by myself. Perfect way to kill an afternoon, guys. 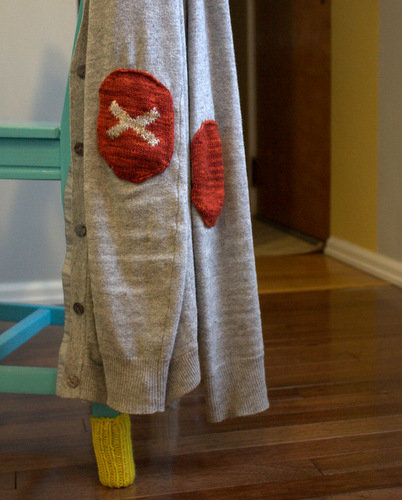 Oh, I also made some super emo elbow patches for this poor old sweater awhile ago. They are knit from leftover Sundara and Malabrigo sock yarns, which are the exact opposite of the Zauerball: full of squish and brilliant colors and not splitty at all. I love the idea of knit elbow patches to brighten up an old cardigan! This was my first attempt, definitely not perfect, but I’m hoping to refine it and share it sometime soon.